Any topic that focuses on changing fortunes over time could adopt this approach, which uses a large bag of sweets to represent a key theme being measured (for example, success, satisfaction or power). A selection of students sit at the front of the class to represent different individuals / themes. The rest of the class decides how many sweets they should have at the start of the period in question. Then a series of events is read out. For each one, a different member of the class is called upon to decide who gained and / or who lost out as a result, and redistribute / take away / provide sweets to the appropriate characters. A log should be kept (e.g. in an Excel spreadsheet) of the sweets held by each person as the simulation proceeds. At the end of the simulation, the sweets should be shared among the group. Students can be asked to spot the most important turning points for different groups and to produce an annotated infographic explaining the most pertinent points. Rule of Mao – sweets represent ‘satisfaction’: Different people in the class take the role of different groups in China (e.g. woman, child, factory worker etc). All are given the same amount of sweets to start with to represent their satisfaction with the regime (although the teacher may wish to discuss whether this is appropriate). The teacher reads a series of key events relating to Mao’s rule. For each one, a different member of the class is called upon to decide who gained and / or who lost out as a result, and redistribute / take away / provide sweets to the appropriate characters. Rise of Hitler – sweets represent ‘power’: Sweets represent the power of different groups and individuals at the end of World War One (or, for a narrower focus, from 1929 onwards). The class decides how many sweets are allocated to each factor. Then as each event is considered, the class has to re-allocate sweets as appropriate until ultimately they are all in Hitler’s hands. Causes of Spanish Civil War – Sweets represent ‘stability’: in the different areas. Timeline of events changes the distribution. Consequences of World War One – sweets represent ‘success’: Each person in the role-play represents a different group (e.g. women; children; medicine; technology; workers’ rights). Each one of these people as a homework exercise has to explain why THEY gained, and why somebody else LOST, as a result of World War One. In the lesson, these presentations / debates can take place before the rest of the class, acting as judges, allocate out the sweets. For added sophistication, the presentations could take place in three phases: (a) Short-term effects; (b) Mid-term effects; (c) Long-term effects. The following case study comes from my website ActiveHistory and the resources for it can be found here. Five students take the role of key members of the Politburo at the end of 1922 who could feasibly have taken power after Lenin’s death (Stalin, Trotsky, Bukharin, Kamenev and Zinoviev). Prior to the lesson each one prepares a short speech explaining why they are the best person to lead the Soviet Union. In the lesson, the five candidates sit at the front of the class whilst the rest of the students form the audience. A large bag of sweets is split between the audience members and then the five campaign speeches are delivered as persuasively as possible. When the speeches are over, each member of the audience splits his or her sweets between the candidates in proportions to reflect the respective political strength of each individual, explaining their reasoning to the rest of the class as they do so. Each candidate counts the sweets they have and we record this in a spreadsheet. Then, I outline the first key event that takes place: Lenin’s funeral, and in particular Trotsky’s failure to attend and Stalin instead delivering the funeral oration. We discuss whose reputation will clearly benefit from this, and whose will suffer, after looking more closely at the details behind these developments in the form of primary source readings and video clips. After discussion, one student is nominated to decide who should lose sweets, how many they should lose, and who should gain them. The new numbers are added into the spreadsheet along with an explanation. 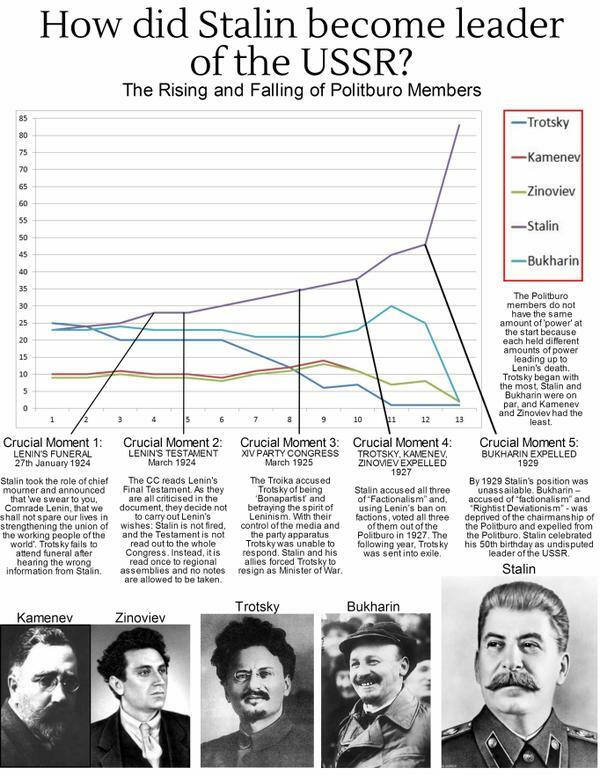 This process is repeated to cover subsequent key events until Stalin is left in an unassailable position in 1929. 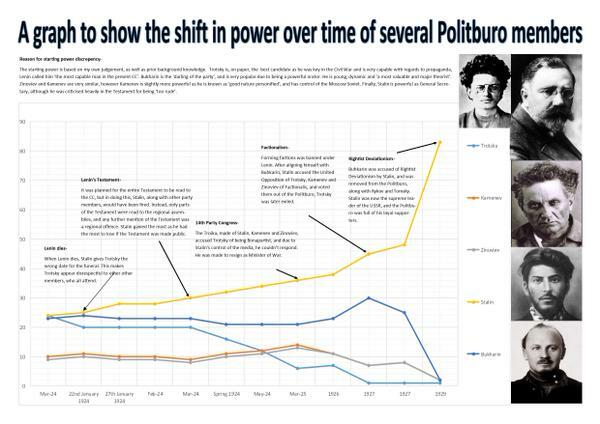 The students then convert the spreadsheet into a graph to spot the key turning points, and categorise the key causes for Stalin’s rise to provide the basis of an essay.